Turtle Town is why Maui is one of my most favorite islands in the Hawaiian Island chain. Not because of the magnificent Kaanapali beach, the magical Haleakala sunrise or the delicious local food they’ve got there – although these are all fantastic reasons that make Maui awesome. If you’re an animal lover and love sea turtles, then Maui will be a lasting memory for you. Make sure you visit Turtle Town for some snorkeling to watch these guys drift back and forth in the sea. Have fun at Turtle Town. Hawaiian green sea turtles and the Hawksbill turtles are the most frequently seen species seen on Hawaii’s shores. While the Hawaiian green sea turtles are a threatened species, the Hawksbill turtles are still considered an endangered species. It is illegal to touch, bother or perform any action that may change their behavior. It is recommended by the DLNR that you stay at least 10 feet away at all times. You can learn more about them on the DLNR’s website. When snorkeling, be sure to always snorkel with a buddy even if the spot is easy or you have a lot of experience. If something happens, one person needs to be able to signal for help. South of Kihei there is a length of underwater lava rock that runs from Nahuna Point to Black Sand Beach. This stretch of snorkeling heaven houses a variety of fish, crustaceans, and yes, sea turtles. Many of these turtles choose to stay in this area and locals and tourists alike now call this place Turtle Town. There are actually a handful of beaches here that are great for snorkeling with turtles. You can ask the locals or hotel staff and they’ll be sure to point you to several different options along Turtle Town. The most important thing to remember is that different beaches in Turtle Town have different difficulty levels. Wind, water depth, waves and even the lava rock all play into your snorkeling experience. Make sure to pick a beach that every member of your group can handle. The most popular beach by far is Maluaka beach. When people refer to “Turtle Town,” Maluaka beach is probably what they’re thinking of. Maluaka beach is a great spot for beginner snorkelers and children. The sand is beautiful so it’s a good place to work on your tan or play some beach volleyball and the water tends to stay calm here since the trade winds are blocked by Haleakala. There are no big signs or fancy entrances here, which is great since it keeps this beach somewhat hidden. To get to Maluaka beach, just stay on Makena road and keep going south. There are parking spaces here so come early to snag one. Check out my post about finding turtles on Maui. 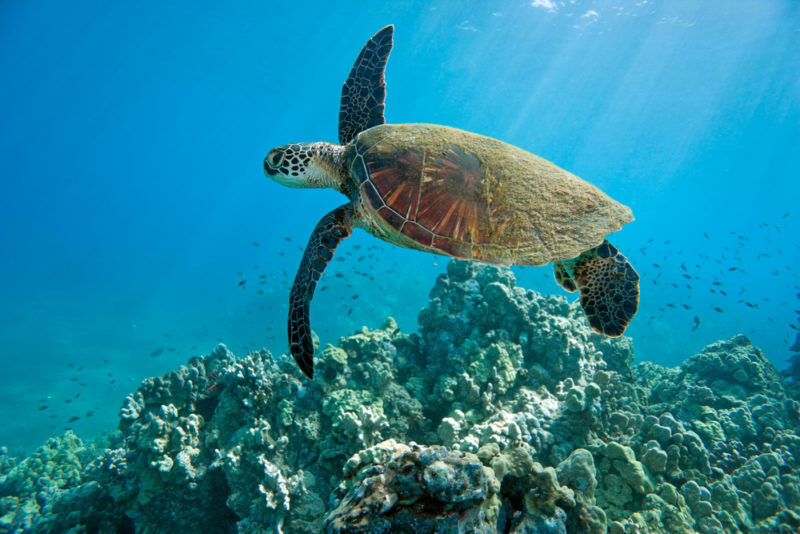 You’ll usually find 2 types of sea turtles in Hawaii: The Hawaiian green sea turtle and the Hawksbill turtle. In Maui’s Turtle Town, you’ll mostly see the Hawaiian green sea turtle. What’s particularly interesting about these guys is that the Turtle Town turtles tend to stay in the area. Most people believe it’s because of the abundance of food that’s available here, creating a mini ecosystem within Hawaii’s waters. The Turtle Town coast naturally attracts these guys because the lava flows have created nooks and crannies that are perfect for them to snooze, catch a snack and offers protection. The rocks and coral in the area block the waves and wind, which allows for calmer waters – a perfect environment that calls out not only to sea turtles, but also to a variety of reef fish. Calmer waters also mean better visibility. A plus for snorkelers in order to get a good look at this underwater world. Turtle Town turtles, like most sea turtles, are comfortable in shallow water so you won’t have to venture too deep when snorkeling in Turtle Town. Remember, no touching, feeding or getting too close to them. It’s recommended that you stay at least 10 feet away from them. 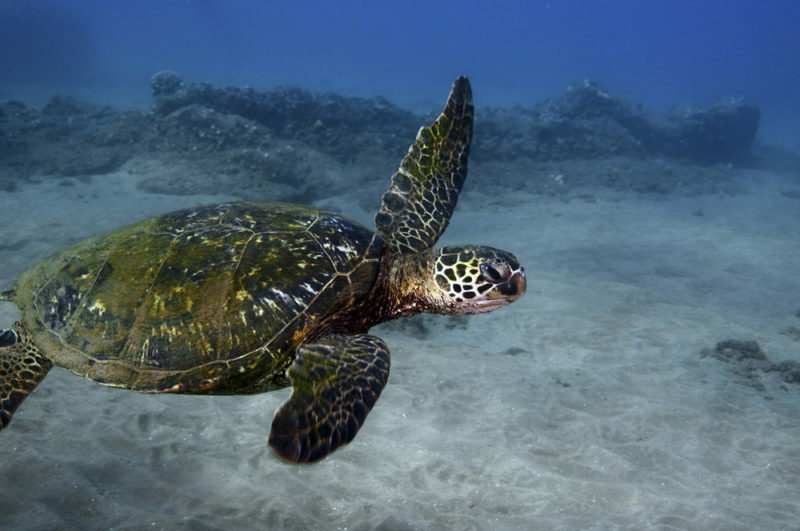 The Hawaiian green sea turtle is threatened, while the Hawkbill turtle remains on the endangered list so interfering with either is breaking the law. Turtles aren’t the only animals that you’ll see swimming around Turtle Town. 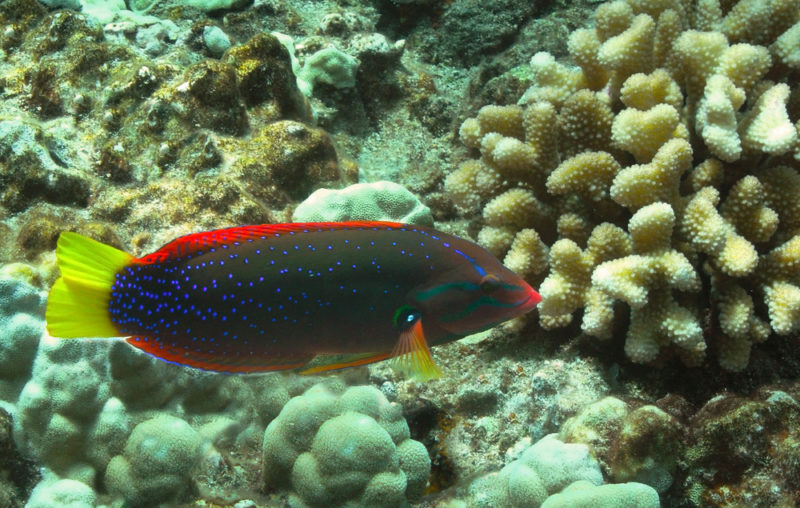 The rocks and coral provide protection and a food source for smaller reef fish so you’ll find all sorts of colorful creatures swimming about. Keep an eye out for the Humuhumunukunukuapu’a, a type of trigger fish that flutters about in our shallow waters. 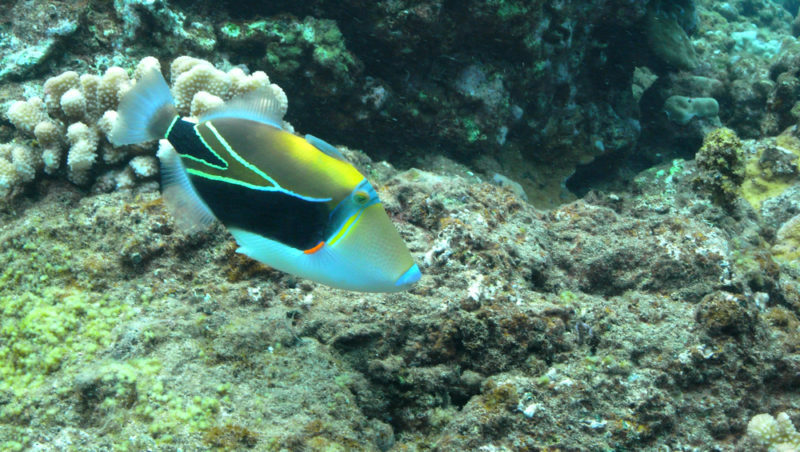 The Manini, a type of surgeon fish, is another cool reef fish that you’ll want to keep an eye out for. They’re known for traveling in large schools and cleaning off the vegetation wherever they go. Not such good news for the coral and other fish, but with big schools it’s almost intimidating when there’s a huge number of them traveling together. Fun fact: In Hawaii lingo we use “manini” to represent something tiny such as “manini waves” or a “manini breakfast”. Other eye-catching sea creatures that you might spot are angel fish, parrot fish, trumpet fish, octopus, eels and sea cucumbers. If you want to do some serious snorkeling, then you need to go on a Molokini crater snorkel tour. Molokini is considered to be #1 snorkel spot in Maui because in addition to the beautiful reef fish that can be found on Maui’s coasts, you’ll also have the chance to see eagle rays, dolphins and even reef sharks! The only way to get to Molokini is through a tour (unless you have your own boat). It’s important to note that you will probably not see a sea turtle while snorkeling the Molokini crater. This is because the underwater environment here is very open and unprotected – the complete opposite of what they get at Turtle Town. Most Molokini snorkel tours coming from Maui include a turtle snorkel (usually at Turtle Town), so make sure your Molokini snorkel tour includes this in your package. 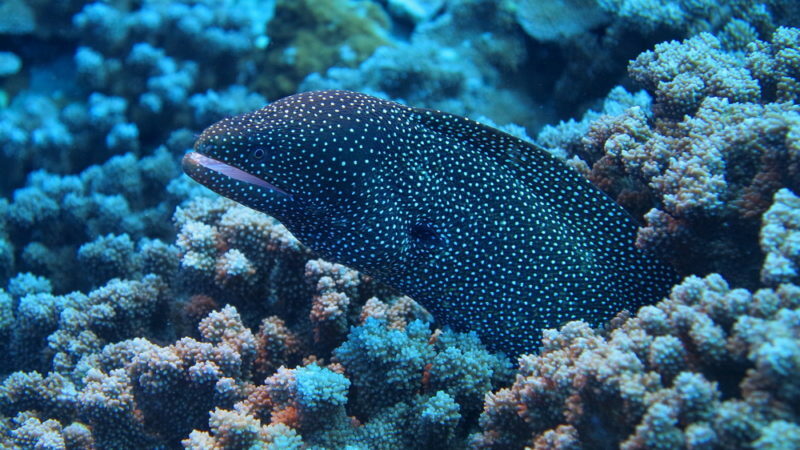 An eel living at Molokini crater. The earlier the better. The mornings have calmer winds, which allow for pristine viewing. If possible, try to get on the earliest tour. Winter tends to be calmer than the summer. And the best part of winter snorkeling at Molokini crater is the chance to spot Humpback whales! If you’re leaving from Maalaea Harbor, you’re most likely leaving from a larger, stable and slower boat – great for people who get easily seasick. However, if you’re leaving from the Kihei boat ramp, the ride will be bumpier but you’ll arrive at Molokini faster. 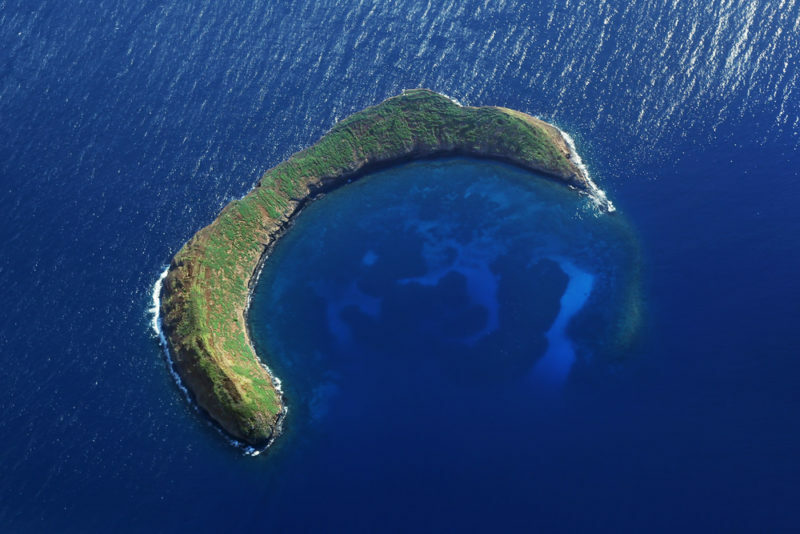 If you have a scuba diving license and will be coming to Maui in the winter, then it’s really worth it to scuba at Molokini. Calmer and clearer waters AND you may hear whale song while you explore! Choose from a variety of tours and book your Molokini excursion!